I've been in contact with Tim Cameron a ton over the past 6 months about his backyard bike park, but today I finally got a chance to get over there and check the place out. The set-up is awesome! Nothing like an effortless set of small & medium jumps where you can flow and have fun without worrying about dying coming up short. I could ride that place all day, every day! Thanks Tim!! Another weekend trip to Sunday Ranch trying like hell to get in as much dirt action as we can before Old Man Winter strikes for good. The place was dialed, so good for this late into trails season! Steve and I headed North to Sunset Ranch in Hatfield, Mass. 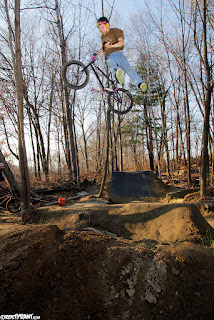 today to meet up with trail boss Chris and a crew for some Fall dirt jump action. When we arrived I was taken back, the place was so dialed and so much bigger than my last visit...only 3 months ago! There were some new lines, the place was packed rock solid, and the lines were running fast as hell. Everyone rode really well and fun was had by all. There was a special guest appearance by Mississippi Mud Flap Morse and his luscious locks were flowing in the wind as he jumped the day away. Psyched on our visit to the Ranch and hoping to get another one in before the first snow. BMX!